We specialize in classes for Knitting and Crochet- over 30 classes every week! Knowledgeable staff always on hand. 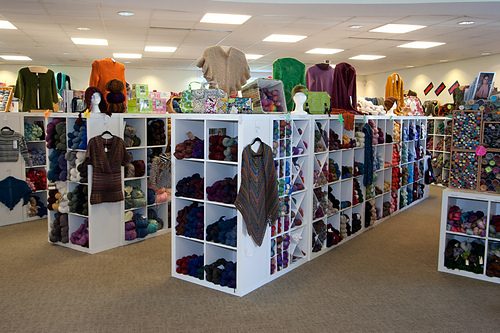 Large selection of samples, yarns, patterns, needles, notions, bags, gadgets and more! Our goal is to offer friendly service in a welcoming and inspiring atmosphere. General Knitting, Beginner and Crochet classes are ongoing with no start or end dates. Classes are held the same time and day each week. There are no commitment or prepayment requirements. Walk-ins are welcome to all General Knitting, Beginner, and Crochet classes. Specialty classes are announced in the weekly email newsletter. Brands that have been purchased at this shop.